Filter press is closed with Ratchet Pinion & Gear for smaller size. Suitable for small & medium size Filter Press. Filtration is a well defined Technology which solves the most Difficult problems in the area of solid- Liquid separation and its becomes important, either to remove undesirable Solids From Waste or to recover clear liquid is the First step in recycling or valuable elements. 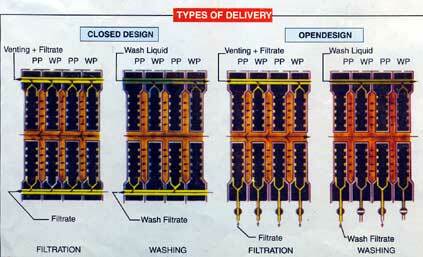 "BHARAT" make Filter Press is the most efficient Solid / Liquid Separation and the employed in all Filtering. Dyestuffs : Dyestuffs, Intermediates, Pigments Dyes. Metallurgy : Nickel, Copper, Zinc, Lead, Silver & Non-Ferrous Metals. Pharmaceuticals : Antibiotics Syrup, Intravenous Solution, Bulk Drugs. 355 x 355 mm. 915 x 915 mm. 470 x 470 mm. 1000 x 1000 mm. 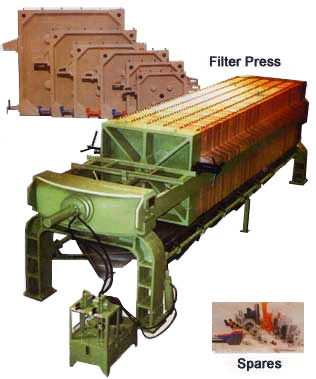 We also undertake maintenance job / contracts of Filter Press Machine. Since last Successive Five years, we have bagged the annual maintenance contract of M/s Atul Limited, Ankleshwar. Our Aim " To Provide Best Quality Products At Most Competitive Rates " to our Customers. Polypropylene Filter Plates Frames & Recessed Plates.